Using tattoos in the service of advertising for a product is nothing new. We’ve seen it time and time again, but it’s at least nice to see that just as tattoos and the tattoo scene itself has been allowed to evolve and transform, so too has the method by which tattoos are now being used in advertising. What I’m talking about is a new advertising campaign for a line of Pilot brand pens. The point of the campaign is to illustrate (no pun intended) exactly how fine of a tip that these pens have on them. In order to do this, the Barcelona based Grey Agency have taken to tattooing Lego people. 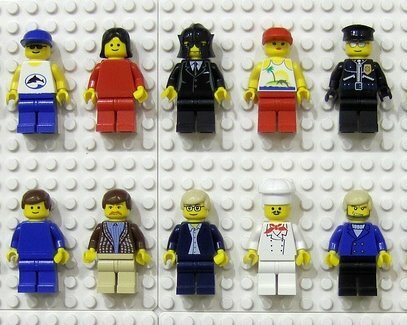 You know Lego people, right? Those tiny little guys that you used to play with when you were a kid? Yup, those ones. The end results are nothing short of amazing – even if tattooed Lego people isn’t something that gets you excited – you’ve got to admit that the work is really quite impress given the size of the er, canvas that the artists had to work with. I must add however, that if you think this kind of stuff is cool, it’s really nothing compared to the stuff that the multi-talented Dr. Lakra has been doing for years. If you ask me, the Grey Agency full on stole Dr. Lakra’s thunder here. I don’t know too much about the Grey Agency, but me thinks that at least one person there was more than a little familiar and inspired by the work of the great Dr. Lakra. Check out the Doc’s work here and see for yourself.